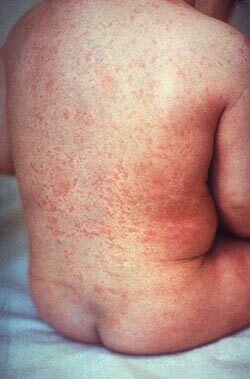 Tigdas hangin is roseola infantum, or viral rash. It is a condition that starts from a high grade fever for about three days, with or without cough or colds. After 24 hours the fever will disappear and tiny red rashes appear on the truck or even cover the whole parts of the body of the child. No treatment is necessary for tigdas since it is due to a viral cause and is self-limited or it will just be gone unless if the child has fever you can give him paracetamol and let him drink lot of fluids to prevent dehydration. There are no basic measures to prevent the particular condition but proper hygiene and a healthy diet. Give him fruits and vegetables to prevent the illness. There’s no need to worry about tigdas unless if it is accompanied by fever. Recently my child have his whole body covered with rashes good enough he has no fever and still doing his usual activities like playing.